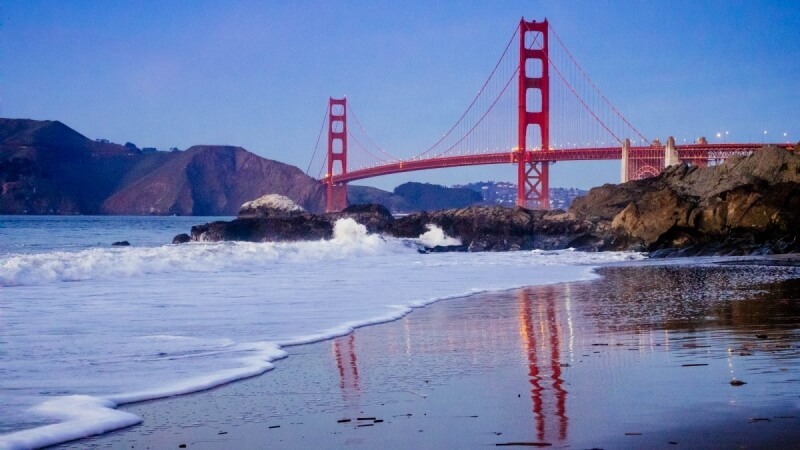 Where better to get that iconic Golden Gate Bridge beach shot than from Baker Beach? This hidden gem is rarely as crowded as Crissy Field Park, which is the other popular spot. Located on the San Francisco side of the bridge, Baker Beach is just west of the bridge, with relatively easy parking. Being west of the bridge means that around sunset, the bridge will be lit with the light of the setting sun, instead of backlit. That means you get to capture the color of the bridge rather than struggle not to end up with a silhouette. I only had my brand new point and shoot, the Canon PowerShot G7 X Mark II as I wanted to try out it out, but there were a couple of photogs with their tripods and DSLRs there. I call this location a one-shot-wonder because one of the main draws is the Golden Gate Bridge beach shot. BUt it’s also a beautiful beach so if you spend some time there, you can capture some other shots. Just remember that although this is California, it’s also SF – so dress warmly as it can get quite chilly and windy. From the sandy hill just behind the beach, you get a bit of a higher perspective on the bridge. You can capture the tiny people on the water’s edge, as well as this large tree that balances the image nicely. You can also go down to the water’s edge, if you want to get shots without other people in them. Of course that depends on how busy the beach is. You’d be surprised how easy it is to get shots without other humans in them. Just get close enough to the water because it’s too cold to actually go in so you should get a clear shot! If you go up close to the water’s edge, and wait until the waves rush back out you can also capture the reflection of the bridge in the sand. Which adds a nice symmetry to the shot. Just remember that the water is going to rush back in and soak you if you don’t get out of the way! Waiting late enough will also make the street lights on the bridge stand out more and add some sparkle. If I had had my DSLR and tripod, I would have waited even longer to get some night shots. Maybe a long exposure as well. But without the tripod that wasn’t possible. There were a few photographers there who had their tripods with them. READ MORE: Tripods don’t have to be expensive. Here are some affordable tripods. If I’d had mine, I’d definitely have stayed longer to get to full blue hour and try some long exposures. But this was just a quick shoot after work so I didn’t have one. Finally do look around for other shots, you never know what you might capture. 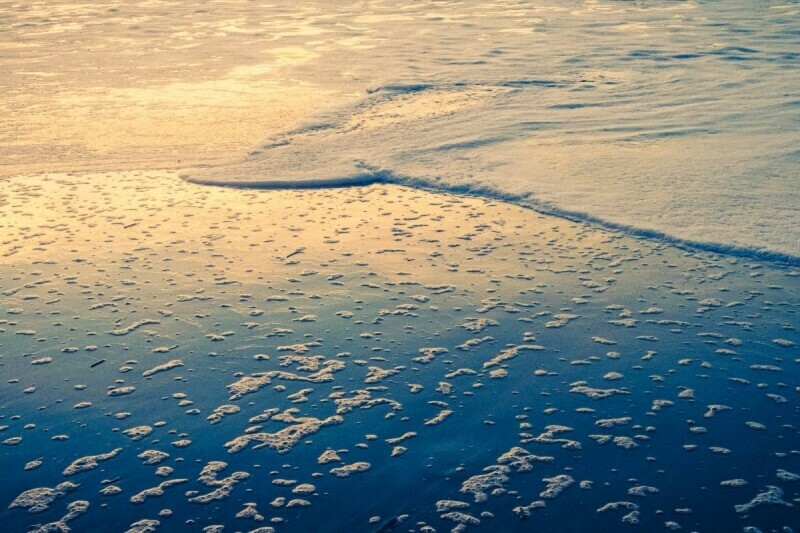 This image of the foam on the sand reflecting the sky could make a nice print. 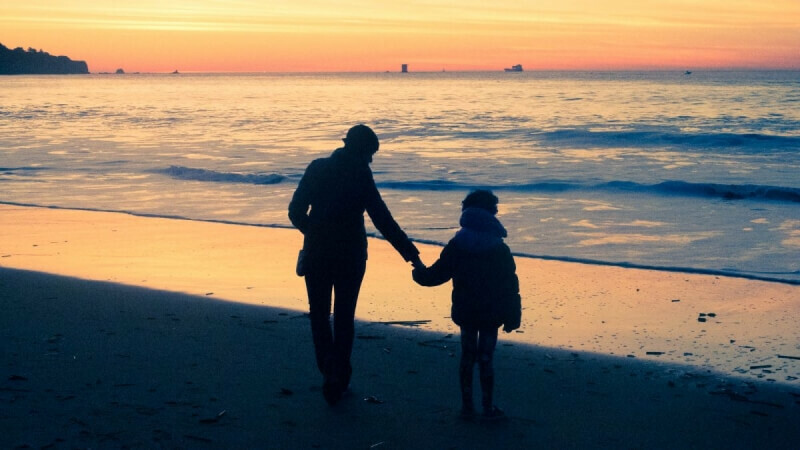 I also caught this silhouette of a mother and child. Watch out for interesting silhouettes, a couple holding hands, a child cartwheeling, a surfer returning from the water. If you want a great shot of the Golden Gate bridge from San Francisco, Baker Beach is a good spot to get it. This post has affiliate links. If you use the link, you don’t pay anything extra but Sidecar Photo gets money for another glass of wine! Photographer, Engineer, Traveler who wants to help you take incredible photographs on your next trip. Join me on a journey to better photos! Enhanced with techniques to learn and gear to get before you go. Enjoy planning your photo trip and get the shots you want!